Ask Vikram what inspired him and he’ll tell you – India. Vikram left India in 1983 to study hotel management in Austria and receive his chef and sommelier training. Soon after, he made the decision to move to Canada after a chance meeting with the General Manager of the Banff Springs Hotel who was visiting Vienna. He immediately recognized the opportunity to establish himself in a country that was still growing and finding its way with culinary arts. With Meeru at his side, the business-minded pair has achieved meteoric success from their humble beginnings with a small restaurant in Vancouver. A dream funded by a small loan from Vikram’s dad and their savings from working in Vancouver’s most respected restaurants. Now, more than 20 years later he still has that first restaurant, Vij’s, named after Vikram’s grandfather. Although it has since changed location and gained a sister restaurant, Rangoli. 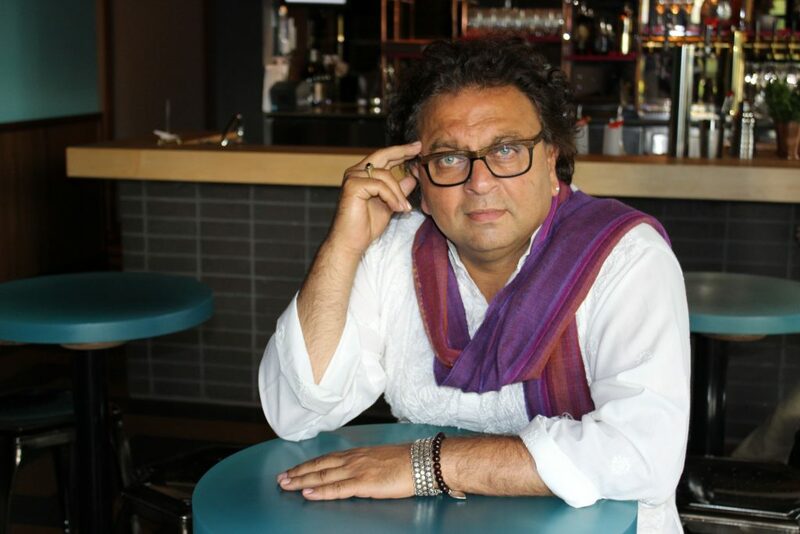 Both restaurants have an almost cult like following with customers returning regularly since he launched Vij’s in 1994. It’s rare for you to find a person in BC who has not heard of Vikram or his restaurants. And with his ‘No Reservation Rule’ still intact, you will hear many Vancouverites share tactics of when to visit and get a table. The rule has been in force since Vikram and Meeru first opened their doors. Their rationale? When they were young and working hard, the pair loved to eat out at good restaurants but they would find that many of the places they wanted to go to were too expensive. They realized that by cutting out the overhead cost of taking reservations they were able to keep their prices more reasonable. It’s a tactic that seems to have worked, with lineups often sprawling on to the streets, as well as a lounge full of people waiting with free chai and hors d’oeuvres, the restaurants are always full and lively. Vikram recently added another restaurant to his roster, My Shanti, in Surrey. It too, has quickly achieved accreditation in the press, as the number one in the Globe and Mail’s Top 10 Vancouver Restaurants in 2014 and one of the Vancouver Sun’s Best New Restaurants in 2014. He credits his success to his loyal staff that has stayed with him for many years. He consciously employs an all-female team in his restaurants, each from an Indian Village, none with formal chef training but all with big hearts and passion. It’s a team he has built slowly and carefully, making sure they each have the right reason for wanting to work for him. And that team has grown more and more each year. He now employs over 140 people across this five businesses, which also includes a new line of frozen foods – Vij’s at Home – and a food truck – Vij’s Railway Express – which was awarded the People’s Choice Award by Air Canada’s enRoute Magazine. Building on the success of their restaurants, Vikram and Meeru have written two books, Vij’s: Elegant and Inspired Indian Cuisine in 2006, and Vij’s at Home: Relax Honey, in 2010. Both of which have received numerous awards, including Cuisine Canada’s Gold Award for Best Cookbook, the Cordon d’Or Gold Ribbon International Cookbook Award and Best Indian Cuisine Book in the World at the Gourmand World Cookbook Awards. It’s part of the reason he launched, Vij’s at Home curries. “It was a chance to have people take my food home and try it and not be intimidated by it.” And what better way to try Indian food, than with this world renowned chef. So what’s next for this energetic entrepreneur? In a recent BC Business article he explained that he has now achieved his goal of opening five businesses before he’s 50, and that he now wants to spend the next five years fine tuning each of them, to make them more efficient, more productive and healthier. Oh and then there’s that small thing of becoming the newest member of CBC Canada’s Dragons’ Den. After years of being featured on FoodTV’s Top Chef Canada and Chopped Canada, Vikram joined Jim Treliving, Arlene Dickenson, David Chilton and Michael Wekerle in October 2014 to decide the fate of aspiring business men and women, looking for investors to make their dreams come true. It’s an opportunity for him to give someone an insight of how they can do it and help them the way his father helped him more than 20 years ago. With all this experience under his belt, what is the one piece of advice that Vikram would give aspiring entrepreneurs?